In a previous post, I discussed how to use the LOC function to eliminate loops over observations. Dale McLerran chimed in to remind me that another way to improve efficiency is to use subscript reduction operators. I ended my previous post by issuing a challenge: can you write an efficient module that finds the rows in a matrix for which all elements are positive? The submissions I received basically fall into three categories: loop over rows, loop over columns, or use the subscript reduction operators to eliminate the loop. 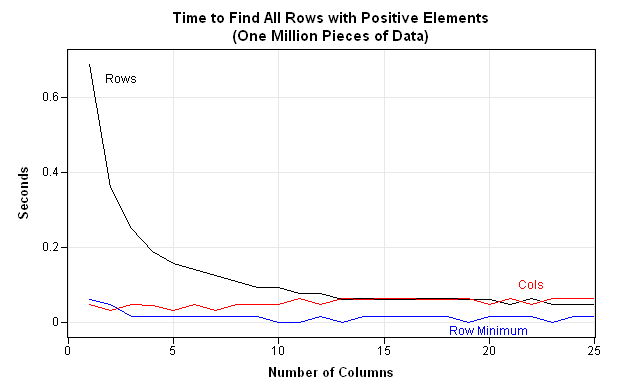 Let's time each algorithm and plot the relative performance as the number of columns varies. The performance of an algorithm depends on the size of the data that is processed. If you fix the size of the data at, say, one million numbers, the algorithms might depend on the number of rows and columns. The following program generates one million random numbers from the standard normal distribution. These numbers are reshaped into matrices with 1, 2, 3, ..., 25 columns, and the time required for each module to run is recorded. The algorithm that loops over rows is substantially slower than the other algorithms when there are fewer than 10 columns. For more than 10 columns, the row- and column-wise algorithms are comparable. Each algorithm processes the one million numbers in about 0.1 seconds. The subscript reduction algorithm processes the data almost instantly for all shapes of matrices. The lesson is that your programs will run faster if you can reduce the use of loops. 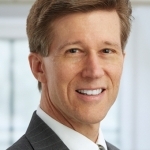 (This is not unique to SAS/IML programs, but is true of all high-level languages such as MATLAB and R.) In the SAS/IML language, both the LOC function and subscript reduction operators help you to eliminate loops in your program. This is a very good article with one flaw: we can't really read the text on your plot. Maybe you could allow us to click on it to enlarge it?? I totally agree with the conclusion, eliminate loops whenever possible! Thanks for the feedback. I have made the image link to the full-size original.